Saudi Arabia has recognized the significance of scientific research in social and economic transformation and has established a large number of universities and advanced research institutes. These institutes have been extended to the far-flung areas of the country. Research in medicine and allied health sciences is an essential domain to produce physicians with high standards of medical knowledge, skills, and professionalism in medical practice and provide better health-care services. In the past decades, the Kingdom of Saudi Arabia established a dynamic environment for scientific research. This period was the golden era of research revolution in Saudi Arabia. The Saudi government rewarded special attention on scientific research through planning to implement specialized research centers and several centers of excellence. In 2017, Saudi Ministry of Education launched multiple research-based programs to motivate the universities and research institutes to produce quality scientific research in the region  and ultimately to provide health-care services to the nation. Keeping in view the efforts of the Saudi government in promoting research in the county, this study aimed to investigate the research production of various universities and research institutes of Saudi Arabia during 2006–2016. This observational study was conducted in the College of Medicine, Research Centre (CMRC), King Saud University (KSU), Riyadh, Saudi Arabia, from June 2017 to December 2018. In this bibliometric analysis, we recorded the research publications published by a number of well-recognized health-care institutions and research centers to authenticate the scientific research productivity in Saudi Arabia during 2006–2016. The number of universities and research institutes was collected from the Ministry of Health and Ministry of Higher Educations. We selected the following universities and institutes which are highly recognized in scientific research in Riyadh, Saudi Arabia: KSU, King Faisal Specialist Hospital and Research Center (KFSHRC), King Khaled Eye Specialist Hospital, King Fahad Medical City, King Abdulaziz Medical City, Riyadh Military Hospital, Security Forces Hospital, Prince Sultan Cardiac Center, King Saud Medical City, and King Salman Hospital. Data regarding scientific research publications in medical and allied health sciences published during 2006–2016 were obtained from the Institute of Scientific Information (ISI) Web of Science, Thomson Reuters (Clarivate Analytics). 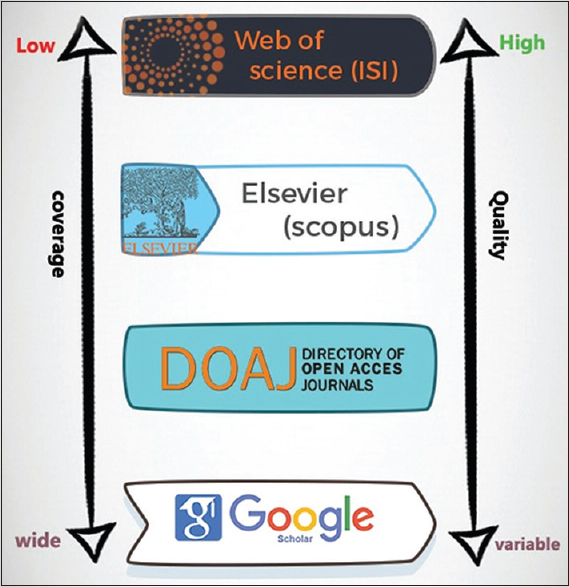 In scientific community, the Web of Science is considered the gold standard source for research discovery and analytics. Globally, it is a highly valid, reliable, coherent, and perfectly organized database, which contains data about research publications, citations, and indexed journals. [Figure 1] depicts a comparison between major indexing databases. Using the Web of Science database, the name of the country “Saudi Arabia” and the name of the Saudi governmental health-care institutions such as “King Saud University,” “King Faisal Specialist Hospital and Research Center,” and “King Abdulaziz Medical City” were entered. For the recording of bibliometric indicators, research outcome in Saudi Arabia was selected, and subject category, field of “medicine and allied health sciences,” and detailed information regarding the bibliometric indicators including the total number of research papers (documents) in medical and allied health sciences were obtained. [Table 1] summarizes the research productivity of different public sector universities and institutes from Riyadh, Saudi Arabia, during 2006–2016. KSU achieved the highest number of publications of 9954 followed by KFSHRC of 3886. During the same period, King Abdulaziz Medical City published 685 articles, King Fahad Medical City 486, and King Khaled Eye Specialist Hospital had an output of 425 publications. 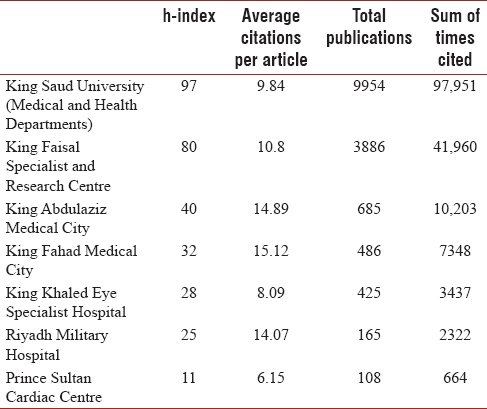 Moreover, Riyadh Military Hospital and Prince Sultan Cardiac Centre produced 165 and 108 publications, respectively [Table 1] and [Figure 2]. KSU's contribution to medical and health publication output among Riyadh medical institutions was 63.4% followed by KFSHRC (24.7%) [Figure 2], and the rest of institutions share the remaining 12%. 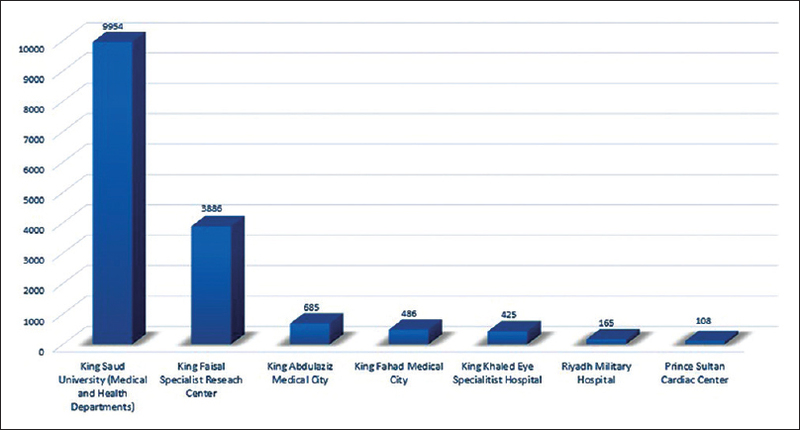 The highest percentages among the rest of the five facilities were 4.4% and 3.1% for King Abdulaziz Medical City and King Fahad Medical City, respectively [Figure 3]. Quantifying the quality of published articles has the same level of significance as the research output. The h-index of KSU publications was the highest (97) followed by KFSHRC (80). KSU published scientific articles which had been cited 97,951 times during this period followed by the published articles of KFSHRC (41,960 total citations) [Table 2]. The government of Saudi Arabia has made tremendous efforts to enhance the country's educational and research system by introducing new educational programs and the establishment of numerous universities and advanced research institutes, especially in the health-care sector. In the present study, we found that in Saudi Arabia, KSU produced the highest number of research articles during 2006–2015. This high research productivity shows the leadership visionary approach, proper spending of the research funding, and their faculty members' contributions. The Saudi government has announced the 2030 Vision, which established a number of objectives in order to achieve the strategic plan of the country. One of the most important goals pertaining to education was to include at least five Saudi universities in top 200 universities and the most important standard to measure the universities' progress is the research productivity. At present, four Saudi Universities are in top 500 universities in the country. In the present study, the primary source for data collection was ISI-Web of Science (Clarivate Analytics). Publishing in an ISI-indexed journal is an essential indicator and considered a significant contribution in a subject. Including the medical and health allied departments of KSU in this analysis was necessary to reveal its incorporation in delivering the goals of the 2030 Vision. KSU's organizational structure includes King Khalid University Hospital, King Abdulaziz University Hospital, and several research centers and research chairs. KSU's medical and clinical units showed a commitment toward the 2030 vision at various levels by attaining the highest number of publications with the highest quality among the other institutions in Riyadh region. KSU and KFSHRC were ahead on the list, with the most significant share of publications' productivity. Mostly, this refers to the fund they receive; besides the high quality of their staff, they use international standards in employing their staff. Bin Abdulrahman , demonstrated that Saudi Arabia had made apparent contributions in scientific research. Meo  published a study and concluded that Saudi Arabia has been passing through a revolution of technology transformation period to meet the mandate of transforming the country into a knowledge-based innovative economy. The country has high ambitions of advancing from the factor-based economic development to the innovation-based economic growth. The present study findings are in agreement with the findings of Meo (2015). In another study, Meo et al. reported that Saudi Arabia's research performance in global medical sciences has markedly increased during 2006–2012. The research publications are continuously on a mounting path. The country improved its regional as well as international research rankings in the world. We obtained the research publications from a very reliable source such as ISI, Web of Science, Thomson Reuters (Clarivate Analytics), which is the strength of the study. However, the limitation of the present study is that during the search of research publications, citation count tools may occasionally wrongly cite the research article with slightly different details. 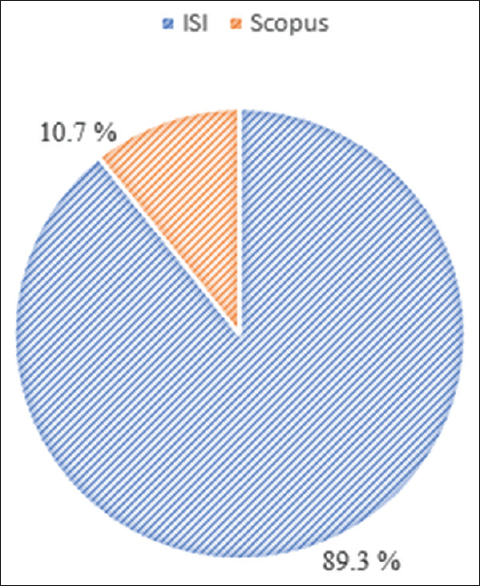 This may affect the number of research papers or citation counts [Figure 4] and [Figure 5]. KSU produced the highest number of research articles during 2006–2016. This high research productivity shows the leadership visionary approach of the university, proper spending of the research funding, and their faculty members' contributions. The authors are thankful to the CMRC, Deanship of Scientific Research, KSU, Riyadh, Saudi Arabia, for supporting the work. Meo SA. Saudi Arabia: A future regional hub for advanced education, research, science and technology. J Pak Med Assoc 2015;65:1112-5. Meo SA, Hassan A, Usmani AM. Research progress and prospects of Saudi Arabia in global medical sciences. Eur Rev Med Pharmacol Sci 2013;17:3265-71. The Secretariat of the Research Centers of Excellence. Available from: https://www.moe.gov.sa/en/TheMinistry/The SecretariatsAndcommittees/Pages/TheSecretariatOfTheResearch CentersOfExcellence.aspx. [Last accessed on 2018 Jan 14]. Kingdom of Saudi Arabia – Ministry of Health Portal. Available from: https://www.moe.gov.sa/en/HigherEducation/ExternalEducation/Pages/RecommendedUniversities.aspx. [Last accessed on 2018 Jan 12]. Journal Citation Report, ISI-Web of Knowledge. Available from: http://www.webofknowledge.com/JCR/JCR?PointOfEntry=Home& SID=4FeKpokbnHkLlmE1OGe. [Last retrieved on 2018 Jan 12]. Academic Ranking of World Universities: ARWU World University. Available from: http://www.shanghairanking.com. [Last cited on 2018 Jan 22]. Khalid BA. The current status of medical education in the gulf cooperation council countries. Ann Saudi Med 2008;28:83-8. Bin Abdulrahman KA. The value of medical education research in Saudi Arabia. Med Teach 2012;34 Suppl 1:S1-3.